Death tells you not resist sudden change – you will be provided the strength and support needed to accept new situations. Leave the past behind now – allow your experiences to be your teacher. Let go of the restrictive, oppressive, limiting attitudes and beliefs that are holding you back – deliberately and consciously “cut out” any excess mental clutter. Start a new project – face your future with new faith as you gently release any outdated ideas or outlived emotional attachments that keep you confined. Trying to scientifically explain a “smile” is to disregard the “joy” for which the smile manifest itself and set the scientific actions in motion. Automatic memory simply happens. Logical memory requires a conscious effort – you must “think” in order to remember. Moral memory is LOVE – when the things which deeply move you are remembered. Vertical memory is that which links the ordinary consciousness to a higher state of consciousness. You KNOW what you pray – for when you pray, you forget daily affairs. The practice of concentration is the “art of forgetting” and meditation is mastering the “art of sleeping” where authentic “faith” is revealed, acts and increases in purification. “Hope” is simultaneously both the agent and the fruit of illumination – it is “love” which achieves union of the soul with God. Spiritual greatness is measured only through faith, hope and love. We do not worship God because he is able to do more than us or because he knows more than us or because he is stronger and more powerful than us – but, rather because He has more faith, more hope and more love than us. God is great through his faith, hope and love and our “fear” of God is basically that of offending such nobleness and generosity! In order to apprehend this – listen and be silent – silence all the faculties of understanding, memory and imagination if you wish to apprehend and to receive a revelation from above. All things must come to an end. “Death” produces a life-giving transformation. It is time for you to allow this transformation – release your “ego”, shed those things which are already “dead” in your life and accept the transition. A major karmic change in your life will occur regardless of your actions – trust that it will be beneficial – accept it, prepare for it and your fears will be released. Free yourself from what is hanging you up and holding you back. Create a space for new opportunities to come in. You fear only the “consequences” of change – that you might make the wrong decision and it is this “fear” which is holding you back from enjoying life as it could and should be. This change will bring an end to the situations in your life which have outlived their usefulness – release from the past through a creative surge of energy. A great aggressive drive toward new experience – deep change – the “death” of automatic instincts giving birth to the freedom of choice. Release old beliefs with a thrusting creative surge leading to action, creativity and new life through the experience of your natural aggression. Allow it to flow freely. You can easily recognize these experiences because you feel such deep emotions that it is a little like experiencing “death” – you feel completely powerless, can handle no more stimuli and need rest. Your “ego” is only a mask, never releasing energy – it fights even sexual climax, for at that moment it must partially dissolve. Accept the death of your “ego” mask and your fears will dissolve as you experience a new maturity and a new freedom of energy. Simply give up the old “ego” mask and allow the transformation to take place. By force of will and with the help of a guide, you allow the knowledge to emerge of who you really are and what habits or fears you wish to shed. This knowledge brings a calming peace – the desire to change and create a new “life” from your old experiences and this allows you to remove the old, unusable aspects of your life in order to free the whole human being. Fundamental, irreversible change of a physical/material nature. The interpretation of cessation of life, actual biological death is of course one possible meaning, but only one out of many others outlined here. One of the major metaphysical purposes for our aging and eventual death is to stop our material stockpiling, to stop us from putting all that energy into lateral growth at the physical level. The fact that we cannot take it with us is the belssing and fundamental lesson of death. With death, everything that we have done, collected, is in the long run for others, not for self. This is the Physical Plane’s lesson of progress from self to other that matches the parallel lesson of self to other in the Emotional Plane (passion to compassion) and in the Mental Plane (little ego to super Ego). Death must be thought of as the mean, the middle, not the end. The phrase “in the dead of the night” means “in the middle of the night”. New beginnings. New phases. New directions. This is the spiritual descended to the physical level and can show reversals of ill health. Acceptance of physical endings and physical lessons. All fears center around change at the physical level. The positive function of fear shows here in its role of preserving life. But, when fear climbs up from the physical level of protection through the emotional and into the mental, it takes on the cloak of irrationality and works against our welfare. Here then is courage, derived from an intimate knowledge of the myths and realities of death. In the first position: There is no fear of death for there is a profound understanding of immortality. There is no fear, but fear is respected and preserved in its proper place as a friend in need. In the second position: You have been in harmony with life’s basic cycles, aligned with the seasons. There may have been an issue of death in the past which is serving as backdrop to the question at hand, but as a positive element. You are brave, having a history of courageous deeds, perhaps even death defying. In the third position: Deal with the matters directly at hand. Physical and material matters predominate. Check on health, security. Be courageous. Welcome change with open arms. Direct prayers for change, not for the status quo. Invoke change. In the fourth position: To be in love with the archetype death in its purest form is simply to love, to welcome change with an open heart. This is the stuff of bravery or chivalry. In the fifth position: You are aware of or you are planning, major change at the physical level. Courageous state of mind. In the sixth position: Heart must make adjustments to the radically new physical/material situation. Things will no longer be as they were and that must be accepted, eventually even welcomed. 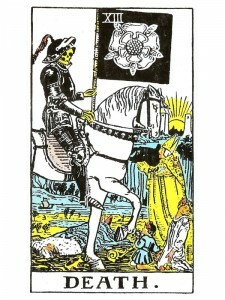 In the seventh position: The mind embraces major physical/material change. Adapting to and integrating the new reality at the mental level. In the eighth position: A major, irreversible physical/material change is taking place now or in the very near future. Here is the physical aspect of the phenomenon of re-birthing, of being born again spiritually. The body undergoes a formidable change in chemistry and in general appearance. In the ninth position: Heart accepts/desires major physical change. It can be the heart’s acceptance of a death, of the lessons of death. In the tenth position: Here is the gift of courage just when it is most needed. The ability to rise above all fears to achieve the tasks at hand. Tina, the death card shows up when there is change required, discarding that which is no longer necessary in your life in order to move forward and bring in new enlightenment. Hope this helps. Have a blessed day! What are your comments on death in the 12th position? Thank you – I just wrote what “spirit” provided. I am so glad I found this site. You look at things in such depth, so “on my wavelength.” All good is reinforced. I thank you so much for this. Out of every single website on the internet (including biddy, psychic-reflections, keen, etc.) dedicated to the tarot – yours is truly the best. Your interpretations are similar to those found in 78 Degrees of Wisdom, but are even more insightful. This website you’ve created is truly cherished by me – thank you for your work here.